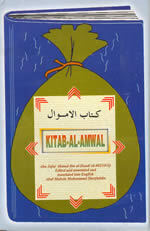 An edited and annotated English translation of a hitherto unpublished treatise on Islamic finance written by scholar of tenth century i.e. Abu Jafar Ahmad Ibn Nasr Al-Daudi Al-Maliki Al-Asadi ( d. 402/1011). The text has been edited on the basis of a unique manuscript, preserved in the Escurial Library, Madrid ( MS No.1165 ). The author's verdicts ( fatawa ) on the settlements of lands in Al-Ifraqiyaah, Al-Maghrib, Spain and Sicily. It also deals with the administration of the properties acquired unlawfully and those abandoned with no legal owners. The work throws light on various kinds of earnings and suggests methods to maintain balance in society between various groups or rich and poor people.